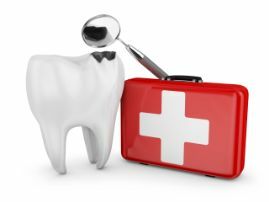 Emergency Dentist in Copperas Cove Gives Advice For 3 Common Emergencies! If you’ve ever had a dental emergency, you know what a nerve-wracking experience it can be! Not only are you in pain, but you may not know the best way to handle the situation either. Should you call an emergency dentist in Copperas Cove right away or go to the hospital? Should you treat it on your own or wait until you get professional care? In this blog, you’ll learn the answers to those questions and get some helpful tips for the most common emergencies. You may not be able to prevent an emergency from happening, but at least you can be prepared for it! How Can You Handle the 3 Most Common Emergencies? After any dental emergency, call a dentist as soon as possible. They’ll either schedule you to come in immediately or will get you the first available appointment. They’ll also give you advice on what to do until your appointment. Broken tooth or filling – If a tooth or filling has chipped, put any large pieces in a small plastic bag and rinse out your mouth with lukewarm water. Apply a cold compress to the outside of your face for any pain or discomfort, and, if necessary, use dental wax from the store to cover any sharp or broken edges until you can be seen. Toothache, abscess or swelling – Any of these symptoms can indicate an infection, which requires immediate treatment because it can be dangerous if it spreads to other areas of the body. Swish with lukewarm salt water every 3-5 hours until your appointment and take over-the-counter pain medication as directed. Knocked-out tooth – For a knocked-out tooth, the sooner you can be seen, the better! An emergency dentist will have the best chance of saving the tooth if you’re seen within one hour. For immediate care, start by gently rinsing off the tooth (holding it only by the crown, not the root) and place it back in its socket, facing the right way. If this isn’t possible, put the tooth in a glass of milk or water. You can hold it in your cheek pouch as well. Above all, the tooth must stay clean and moist until your appointment. Aside from the emergencies listed above, there are some situations that require immediate medical care. First, if you have heavy bleeding that doesn’t subside after applying pressure for 15 minutes, go to the nearest ER or urgent care center. Also, go to the ER right away if you suspect that you’ve broken your jaw. After you’ve been stabilized, you can call a dentist to find out if any restorative work needs to be done. Dental emergencies are alarming for anyone, but you’ll be better prepared to handle them with these tips. And rest assured that an emergency dentist will not only restore your smile, but also get you out of pain as fast as possible! Dr. Daniel Caraveo is a general and emergency dentist in Copperas Cove who has helped countless patients and families through dental emergencies. With years of experience and advanced restorative training, he’s able to help his patients recover from emergency situations as quickly and comfortably as possible. If you have any additional questions, he can be reached via his website or at (254) 547-4866. Comments Off on Emergency Dentist in Copperas Cove Gives Advice For 3 Common Emergencies!